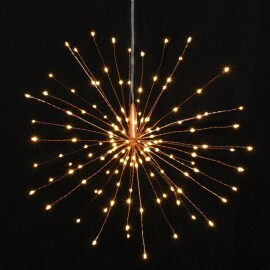 The hanging ornamental Copper Starburst light will bring a 'starkle' to your décor this festive season. The battery operated (requires 4 AA batteries, not included) illuminating diameter is 30cm, with 120 warm white LED's. The lead wire is 80cm. There is a build in timer - 6 hours on/18 hours off. The mains operated Starburst is larger, with an illuminating diameter of 50cm and 200 warm white LED's. It includes a transformer and the lead wire is 8 meters.